Assassinate Helvard to complete a Dark Brotherhood contract. Once you have spoken to Nazir you will have found out that Helvard is the Housecarl to the Jarl of Falkreath. You may find Helvard in the Jarl's Longhouse in Falkreath. If you approach Helvard before attacking him, you will be given 3 dialogue options, you can only pick one as you won't be able to speak to him again. An alternative is to use stealth and kill Helvard while he sleeps in the Jarl's Longhouse. Completing this quest may make it impossible to purchase Lakeview ManorHF from Siddgeir. If Dengeir of Stuhn becomes jarl, you may still purchase the property. You may also still purchase property if you complete Siddgeir's quests after killing Helvard, or exile him in Season Unending and later retake Falkreath for him. You can inspect the relationship rank with the jarl by using the player.getrelationshiprank console command (normally you should get -2 foe, or worse) likewise you may set a good relation (positive, max 4) with the jarl by using this player.setrelationshiprank 19822 4 command. A relationship rank of 3 or better will allow you to purchase property. 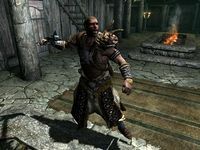 10 I must kill Helvard, the housecarl of Falkreath. I may use any means at my disposal. When I am done, I am to report back to Nazir at the Sanctuary and collect my reward. 200 Finishes quest Helvard is dead, and I have collected my reward from Nazir at the Sanctuary. On the PC, it is possible to use the console to advance through the quest by entering setstage DBSideContract11 stage, where stage is the number of the stage you wish to complete. It is not possible to un-complete (i.e. go back) quest stages, but it is possible to clear all stages of the quest using resetquest DBSideContract11.